Tobyjoe and I packed up our books back in June because we thought we were moving in July. That didn’t happen because our landlords said we could stay through December. Another thing that didn’t happen was the unpacking of said boxes. They’ve been taking up space in our bedroom ever since. 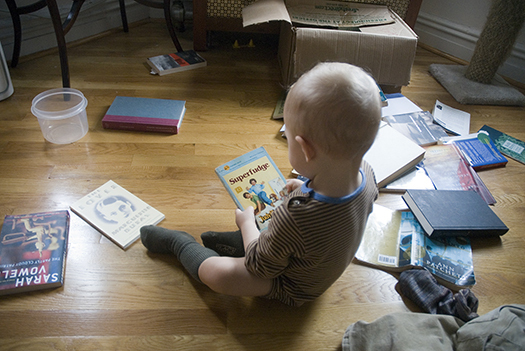 Emory (like most toddlers) gets a kick out of emptying boxes (among other things). 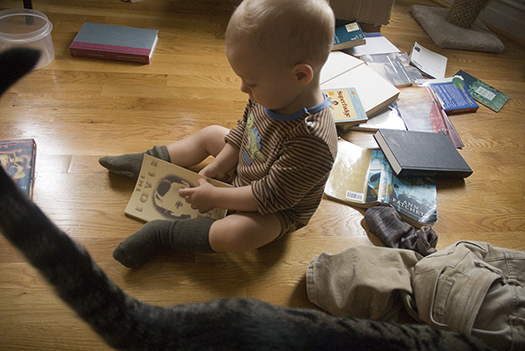 The other day I caught him emptying one of the boxes of books. He was really interested in one particular book. Then he grew up and went to college. Previous Post Getting Acquainted with Feces. Not only are his reading abilities obviously quite extraordinary, but I love the fact that you have a copy of Superfudge! I surely hope you have Tales of a Fourth Grade Nothing to go with it! I hear you about toddlers getting into things. Nothing is sacred when you have a toddler about! I see you have the book “Bel Canto”. We just finished reading that in our book club. What did you think about it? Did you tell him the “Fudge Pack” story to go along with Super Fudge? Hurrah @ The Party Cloudy Patriot and Superfudge! I’m just wicked, wicked proud of him for picking up The Lover. Somebody spent some time in Boston. Those are, like, my two favorite books, ever.